Anonyty explores the intimate boundary between our physical and digital identities, by bringing to life digital people that interact in our real world through movement. Felicia Avalos, Anthony Gongora, and Jezell Modell, from Maida Withers Dance Construction Company, perform interactions between the real and virtual, the dancers, and the guests during the Gala openings of the Washington Project for the Arts 40th Anniversary Celebration in the new gallery in the JBG Companies’ Atlantic Plumbing development at 8th and V street NW, in the U Street Corridor, Washington, DC. 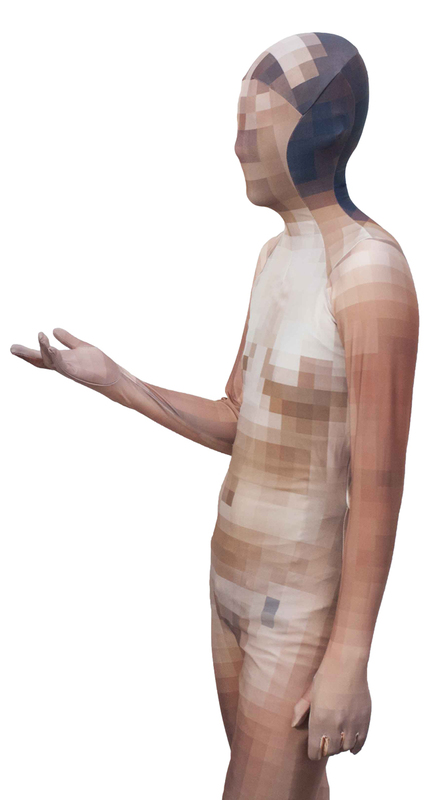 Full body digitally printed morph suits are created by Amelia Zhang, Rhode Island School of Design in collaboration with Brian Kane, respected visual artist and fashion technologist from Boston. The suits are completely covered with custom digital photography of persons other than the dancers which simulates the “pixelated” effect of digital images, bringing a privacy enhanced digital version of a real person moving in the real world, and interacting with real space.